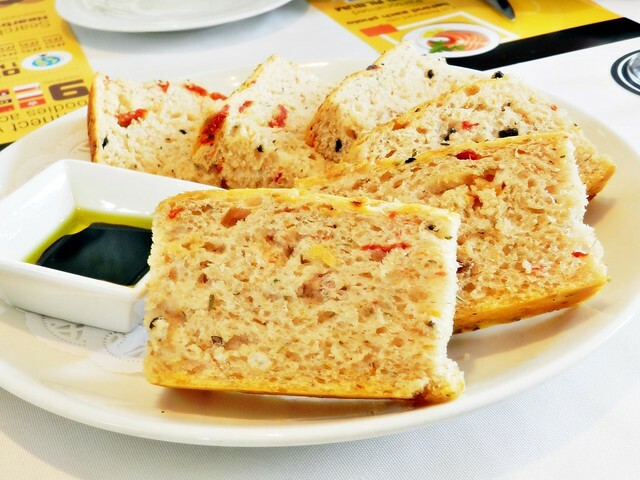 Some images are courtesy of Open Rice Singapore. 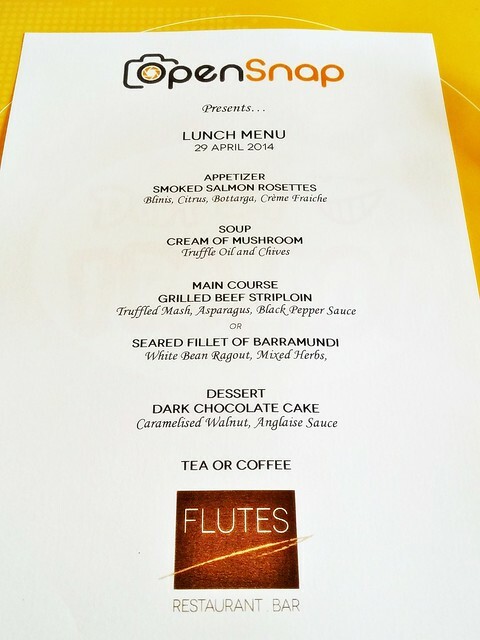 Despite initial hiccups, the day finally arrived for the launch party of OpenSnap, the latest mobile app for foodies. 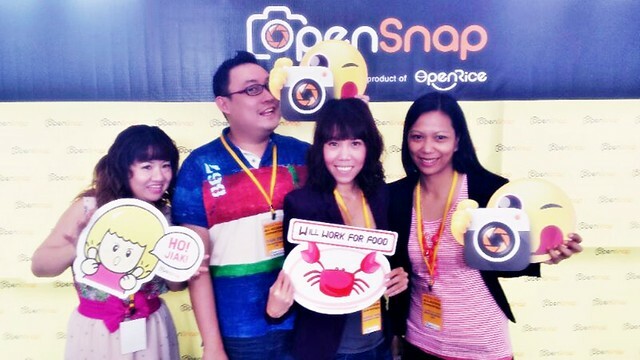 Developed by the Open Rice Singapore team, OpenSnap allows foodies to share their food moments, and also to find restaurants through photos! 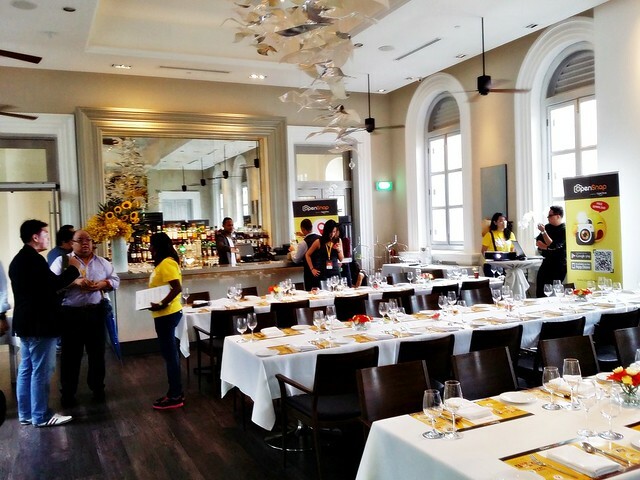 On 29th April 2014, Singapore's media descended upon Flutes Restaurant Bar at the National Museum. The Open Rice team had turned out in full force to welcome guests, along with hired emcees and even setting up a photobooth. We were each given an iPad preloaded with the OpenSnap mobile application, and showed the basics of how to use it. OpenSnap is almost like a mirror of the Open Rice website and Open Rice mobile app, being search-oriented. However, instead of searching through text, users of OpenSnap can also search by photos, user reviews, or by nearby restaurants. 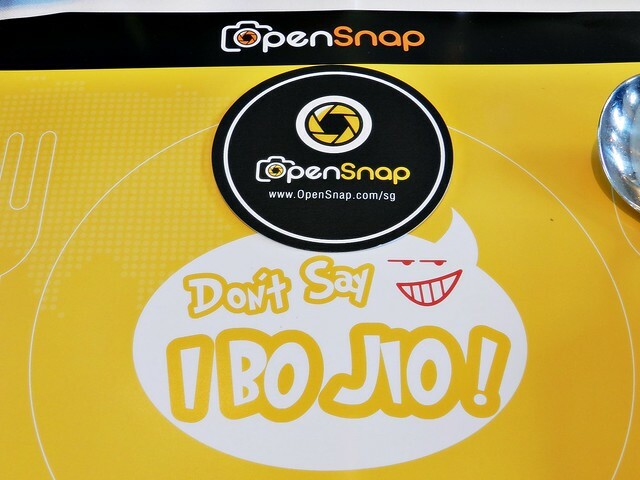 OpenSnap also functions like a mini social platform, allowing users to engage and follow other OpenRicers. 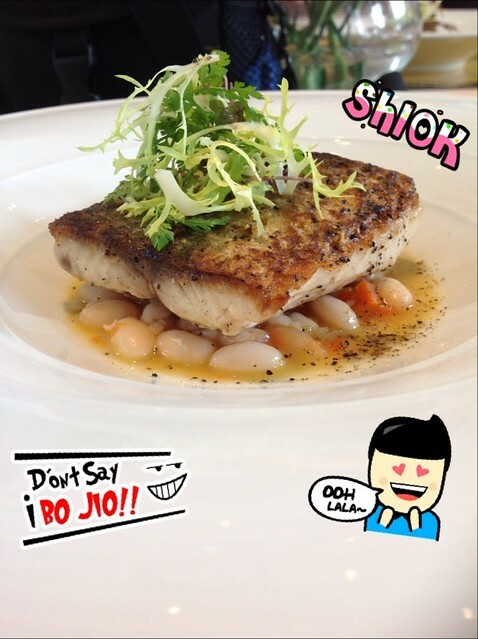 This brings it into direct competition with more established mobile apps such as Facebook, Instagram or FoodSpotting. The edge that OpenSnap has over these other mobile apps includes being a dedicated food app, as well as a unique way to search through photos. 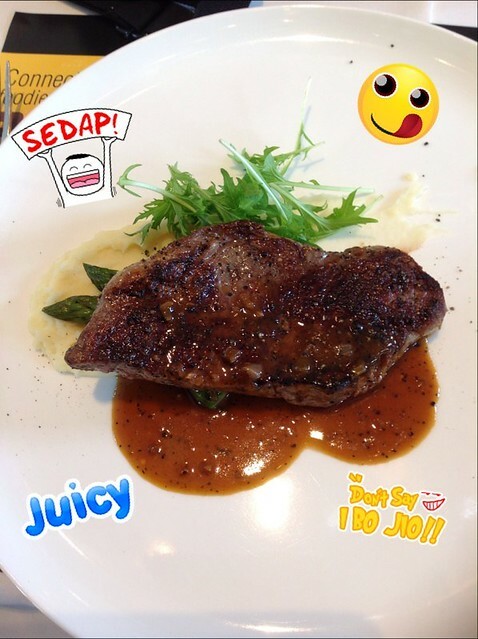 Furthermore, OpenSnap further differentiates itself by allowing users to not only edit photos within the app, but to also add food comments in the form of stickers! I like that OpenSnap is easy to use, and quite fun / playful. I especially love that it's smart enough to sort photos into personalised albums base on restaurants, and also doesn't consume too much battery or memory space as compared to other apps. 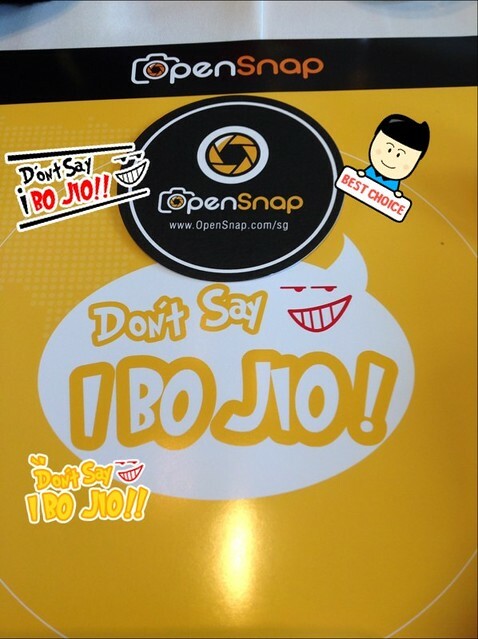 Overall, the OpenSnap mobile app by Open Rice Singapore is a fun, useful application. 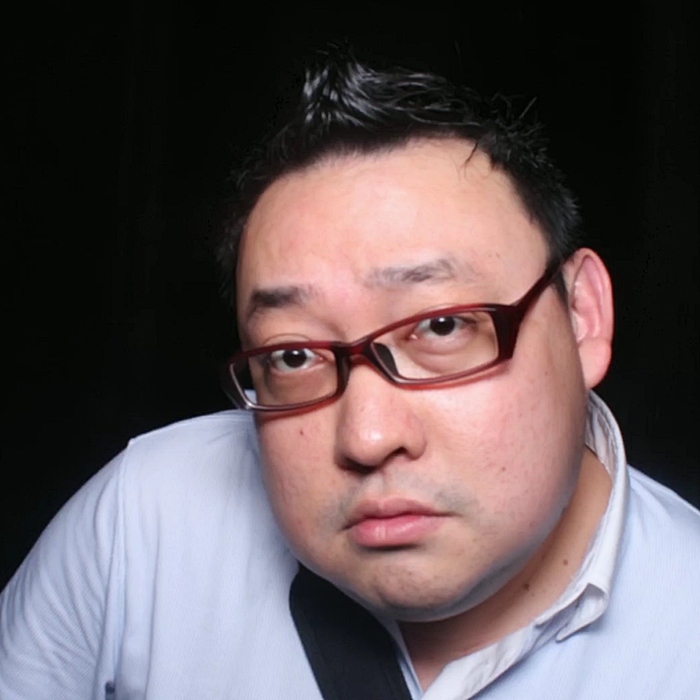 And while certainly different in some aspects, it has quite a long way to go to compete with the established brands. 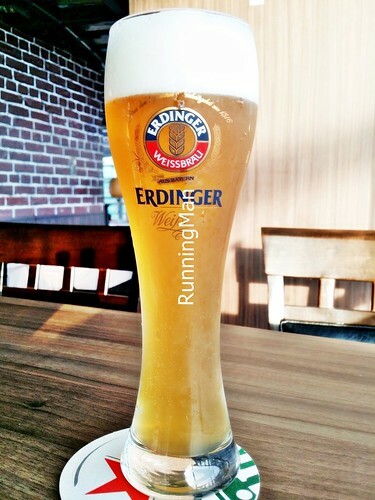 You can try out OpenSnap here: http://www.opensnap.com/ or the original OpenRice mobile app for Android: https://play.google.com/store/apps/details?id=com.openrice.android.sg or iPhone: https://itunes.apple.com/us/app/openrice-singapore/id442911201?mt=8. 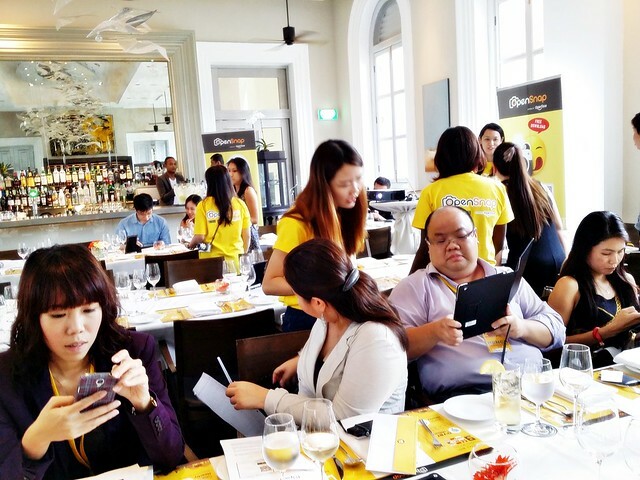 Attended with representatives from OpenRice, Alvinology, MediaCorp, and Singapore Press Holdings (SPH). Budget about SGD $55 ++ per person. 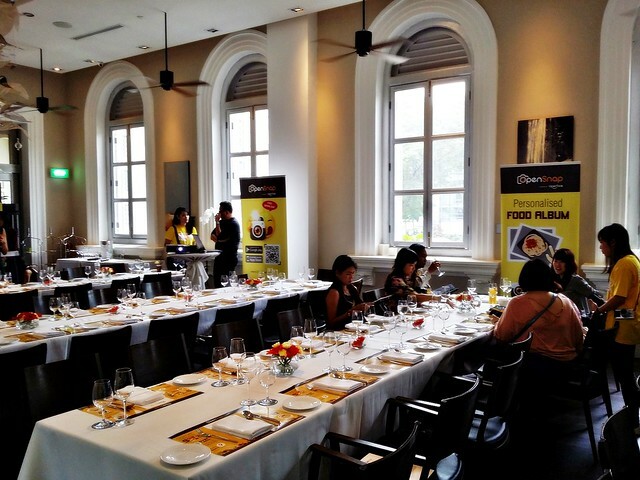 Since moving from Fort Canning, Flutes Restaurant Bar, otherwise known as Flutes At The National Museum or simply Flutes, has retained its position amongst the premier fine dining restaurants in Singapore. 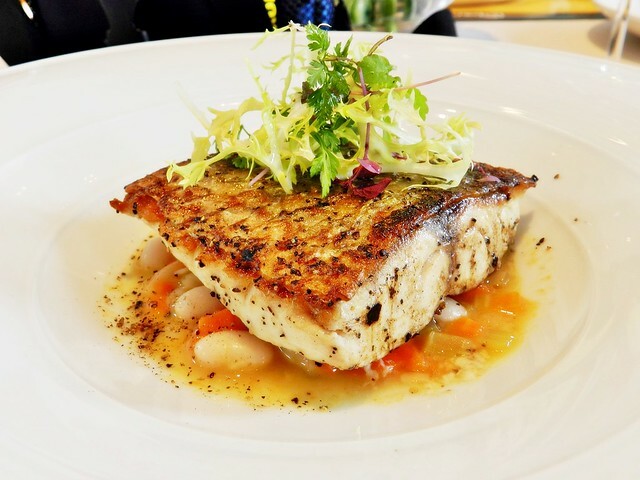 Since 2004, Flutes Restaurant Bar has been associated with old world / colonial elegance, offering a smart casual dining experience with great food and wine in historic settings. And yes, they do hold events, with weddings beings especially popular. 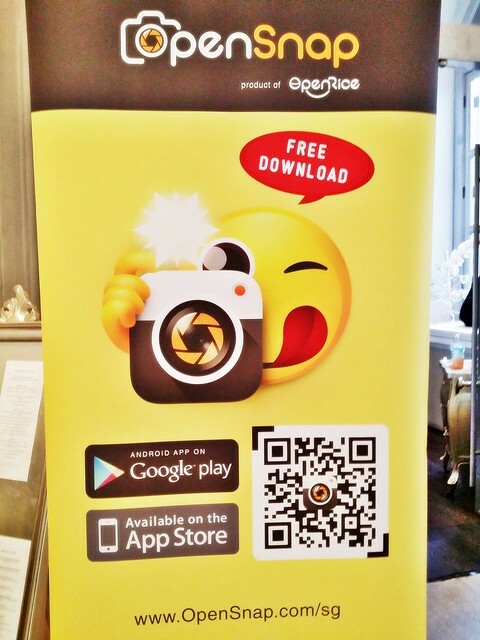 We visited for the OpenRice launch of their new mobile app, OpenSnap. 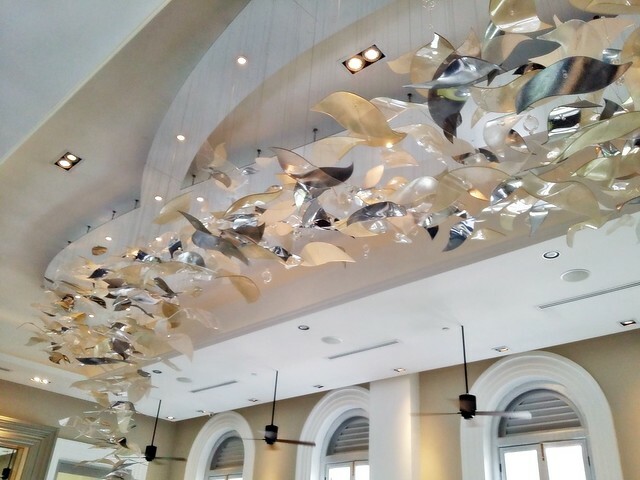 Framed by the white walls of the National Museum, Flutes Restaurant Bar exudes a charming and elegant sophistication. 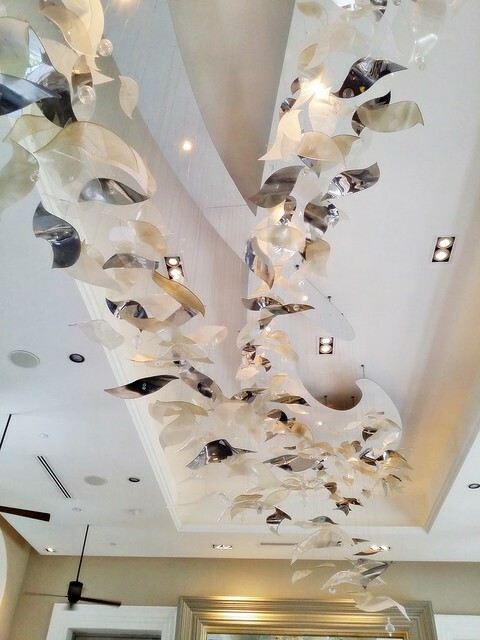 Large windows allow the interior to be lighted naturally, while the artistic touches along the ceiling draw the eye. Furniture is thoughtfully laid out, comfortable and allows for excellent dining conversation. 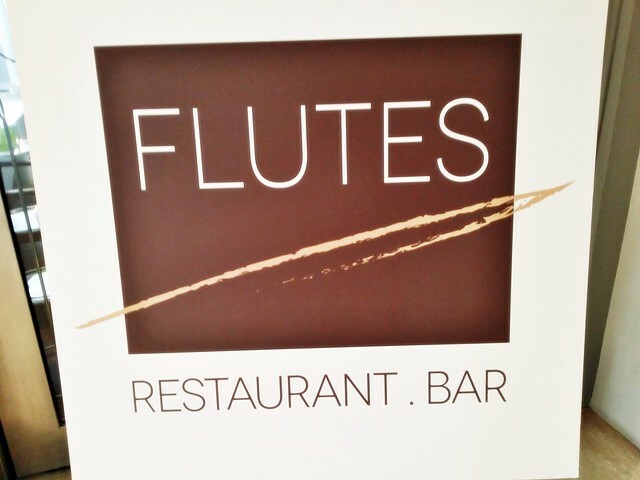 Service at Flutes Restaurant Bar is friendly and discrete, you almost don't notice that staff are there serving you! I liked that they check politely for meal choices, as well as offering more drinks when they notice you're almost out. I also liked that they check on your meal, and take feedback well. 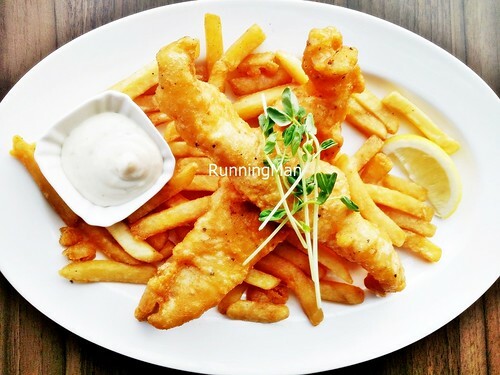 Food at Flutes Restaurant Bar revolves around British English and Australian inspired cuisine. 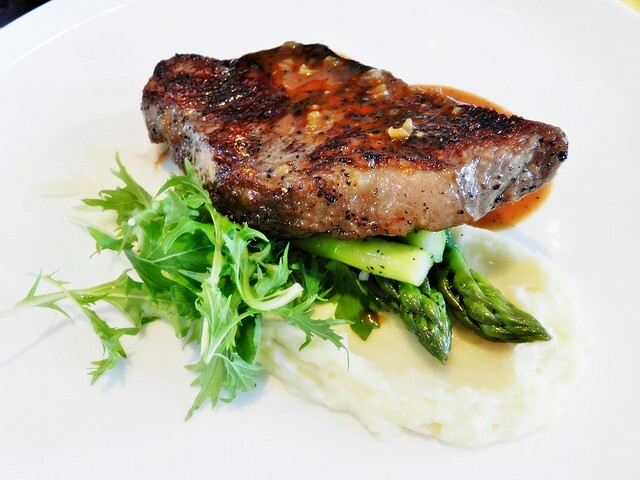 Dishes are generally tasty and well portioned for one, presented beautifully and feature fresh, quality ingredients. Not surprisingly, prices reflect the fine dining standards here. Flutes Restaurant Bar is also known for their extensive list of mostly Australian wines. 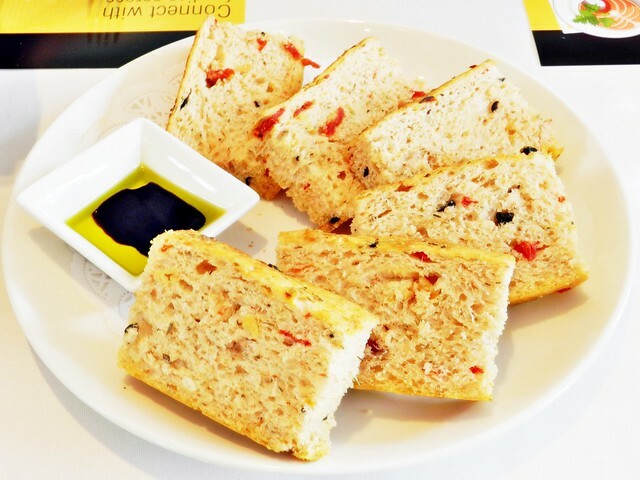 We started with an Italian inspired Sun-Dried Tomato Bread with olive oil and vinegar dip. Freshly baked in-house, this was fragrant and soft, lovely to eat! 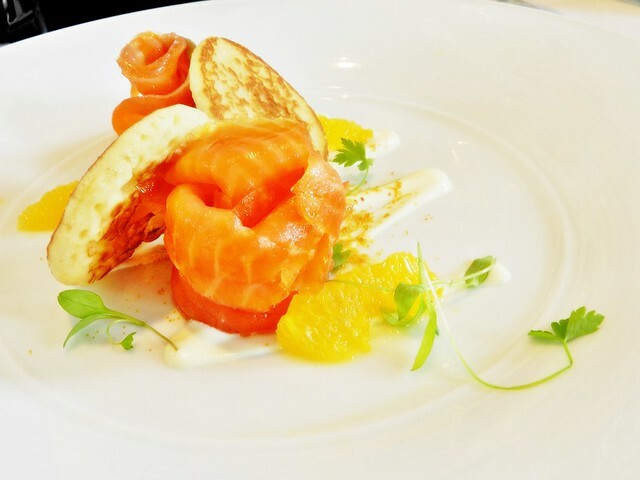 Loved the Smoked Salmon Rosettes appetizer! 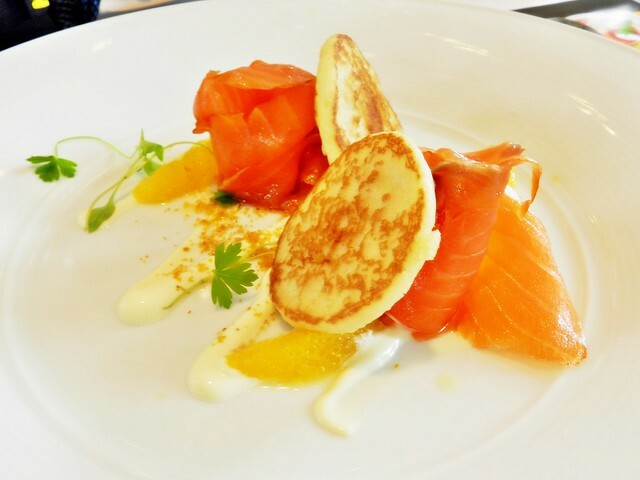 The salmon was nicely smoked and meaty, and the beautifully crafted blinis were soft and fluffy. Paired with micro greens, zesty grapefruit, salty bottarga (cured fish roe) and thick creme fraiche, this went down a treat. 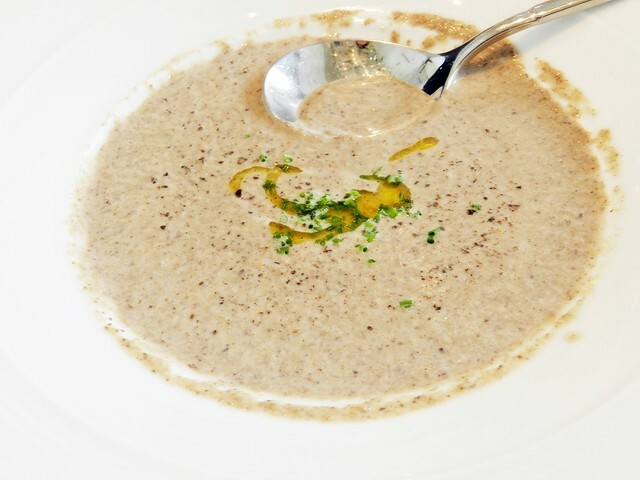 The Cream Of Mushroom With Truffle Oil And Chives soup is extremely satisfying. 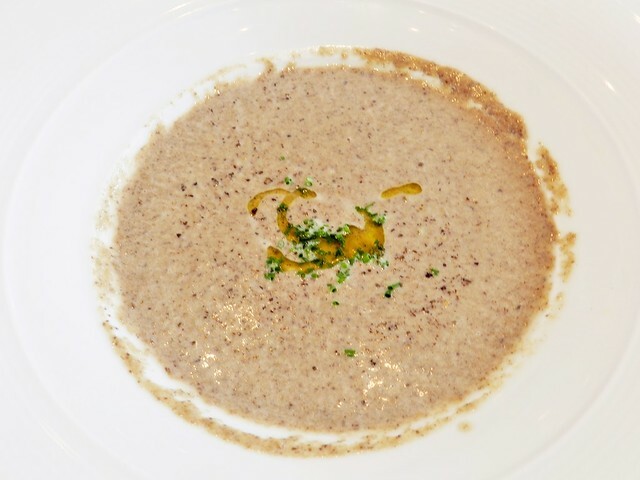 The fragrance of truffle oil lends a rich earthness, while the mushroom soup is thick in texture and rich with mushroom flavour. 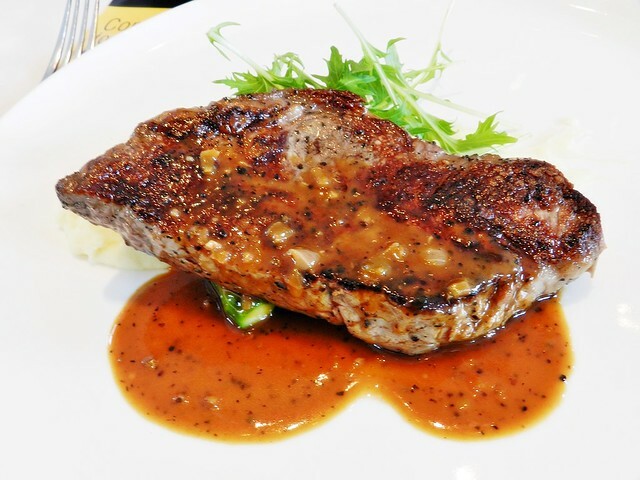 The Grilled Beef Striploin features a thick cut of prime beef striploin, done till medium rare. Despite the tasty, moist interior, the meat was tough and difficult to cut, let alone chew. Would have been slightly better with a thinner cut of beef. The asparagus was fresh and crunchy, and paired well with the fragrant and smooth truffled mashed potato. Overall a tasy dish, but disappointing in the texture of the meat. 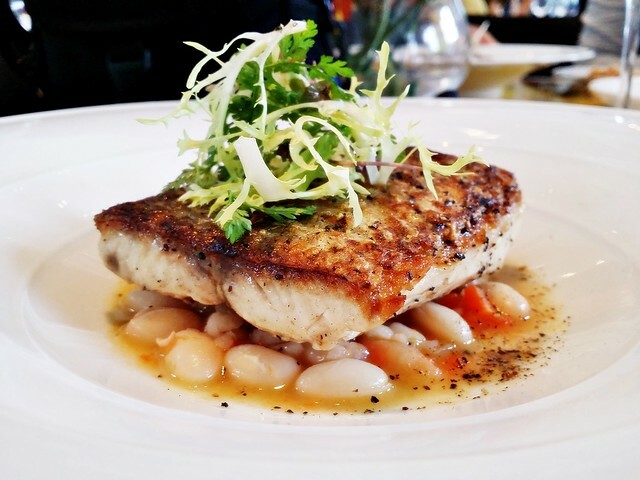 In contrast, the Seared Fillet Of Barramundi was excellent. 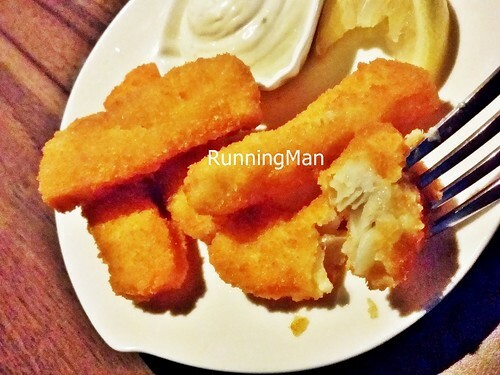 The fish was soft, flaky and meaty, perfectly done. The white bean ragout was fragrant with herbs, onions, tomatoes and pepper. Lovely dish, I highly recommend it! 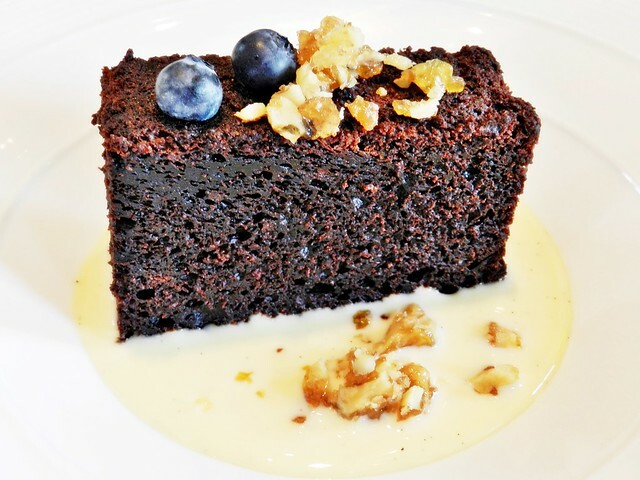 The Dark Chocolate Cake With Caramelised Walnuts has a rich, almost brownie like cake, but isn't as rich or dense as an actual brownie. 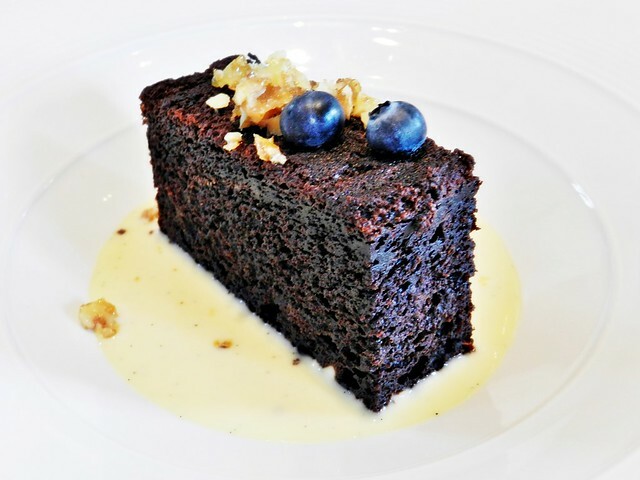 Rather average, but the addition of the cunchy walnuts and sweet, creamy anglaise sauce made it much better. 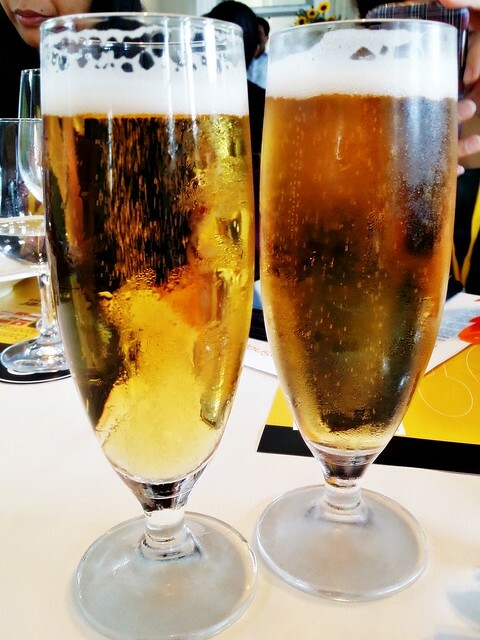 Finish with beer or wine! Overall, Flutes Restaurant Bar is a great dining option for romantic dinners, events, or simply for great food and wine. 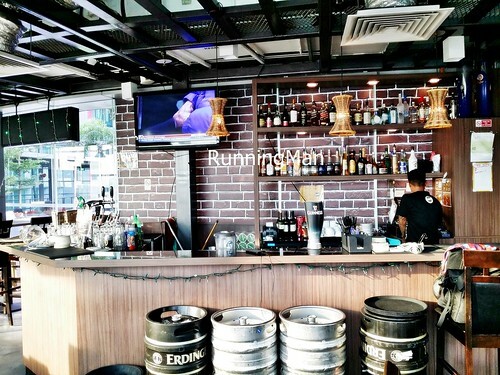 As one of the few bars / watering holes in the far eastern side of Singapore, Slackers' Bar & Cafe has an edge over its competition: a rooftop view, and good ambience. And while office workers around the area may go there to 'slack', the staff certainly aren't relaxing! 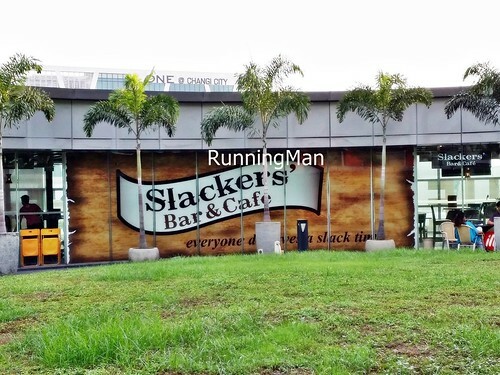 The best thing about Slackers' Bar & Cafe is the rooftop ambience, with a view of the 2 shopping centers surrounding it, Changi City Point and UE BizHub. The rooftop garden adds a touch of greenery, while Slackers' Bar & Cafe leverages on the ample space here to allocate a Darts area. They also have a free Snooker / Pool table for customers! Service at Slackers' Bar & Cafe definitely isn't slack. Staff are friendly, and take orders quickly, though fulfilling orders can take a good 15 - 20 minutes. The interior of Slackers' Bar & Cafe is small, but the space is put to good use, with the bar at the front acting as a visual display. Slackers' Bar & Cafe offers both Western and Asian cuisine, focusing on burgers, pasta, pizza, and bar bites. It seems most of the dishes have a generous portion, and are prepared to order, which means a slight wait for your food. A side note, interestingly enough, it appears that Slackers' Bar & Cafe has had some problems with a recent Groupon promotion, and most diners who utilised the Groupon voucher at Slackers' Bar & Cafe had negative experiences due to some miscommunication of T&C. 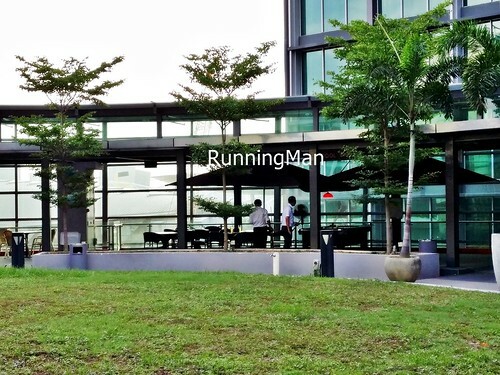 The lush greenery of the rooftop, and the view of both Changi City Point and UE BizHub make the ambience here stand out... Even without their free snooker / pool table and darts area. 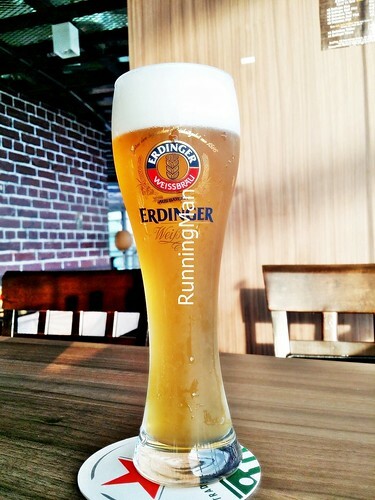 Beer Erdinger Weissbier (SGD $16 Half Pint x 2, SGD $22 Full Pint x 2) is on tap here, and Happy Hours mean the prices here are among the cheapest in Singapore for this beer. 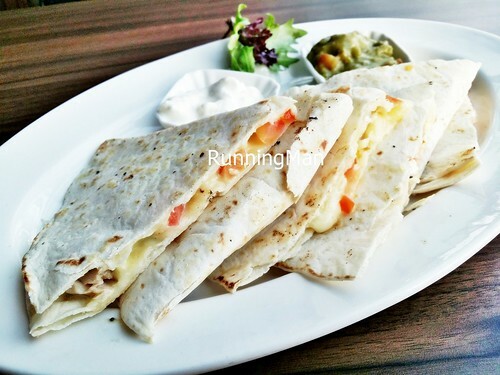 The Chicken Quesadillas (SGD $18) has nicely melted cheese, grilled chicken that is still slightly moist and not dry, diced fresh tomatoes and jalapenos for a tangy, sour and spicy kick. I loved the accompanying sour cream and home made salsa. 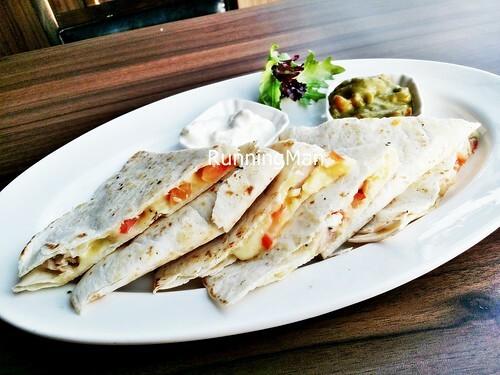 But the ration of filling in the Chicken Quesadillas is poor, with very little chicken, and an overwhelming amount of cheese. 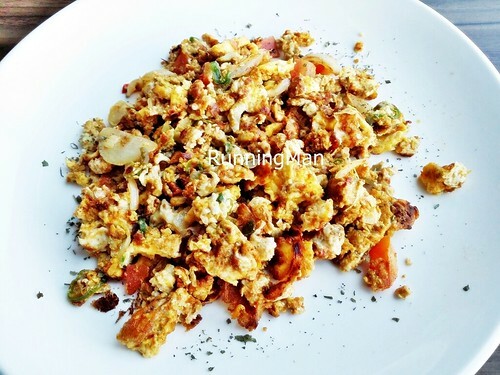 The Egg Burji (SGD $6.95), or Egg Poriyal, is a delicious mix of scrambled eggs, diced tomatoes and onions with Indian spices. Originating from Tamil Nadu, South India, this traditional Indian side dish makes for an unusual bar snack or appetizer, and is quite popular here. 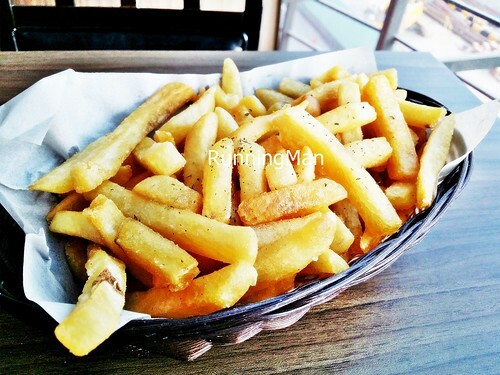 The Basket Of Fries (SGD $7.95) is a nice sharing basket of thick cut, warm and crisp fries. Lightly salted and with a nice potato flavour. Excellent with beer! 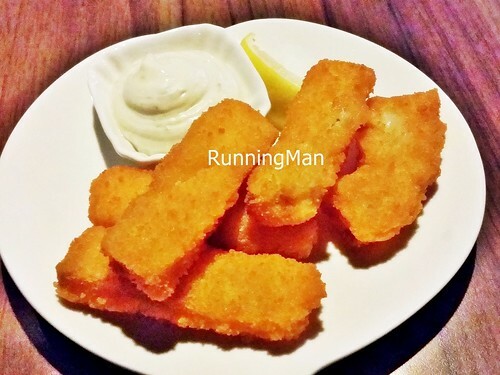 The Fish Fingers (SGD $8.95) arrives with 5 perfectly cooked pieces. Crisp exterior, with a hot interior, drizzled with a dash of lemon juice, just lovely. Can you do this at home? Sure. But I still like it! 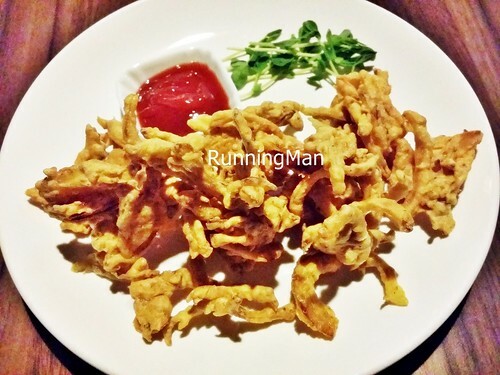 The Onion Pakoda (SGD $7.95) is a traditional South India snack, consisting of a basic deep fried onion fritter battered with Indian spices. Slightly spicy, crunchy, and with a hint of sweetness from the fresh onions, this is a great bar snack. 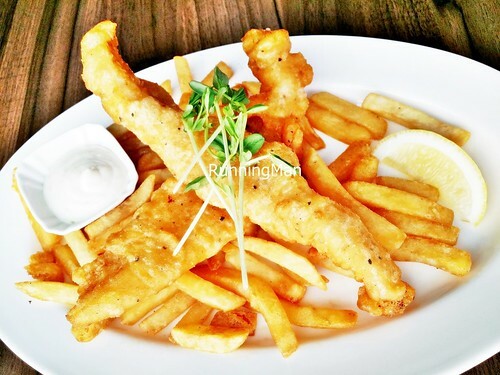 The Slackers' Fish And Chips (SGD $16.95) features 2 strips of creamy dory fish, in a thin but limp batter. The portion is large, and quite filling, but the taste is just about average, no better or worse than others I've had elsewhere. Decent dish to order if you're here, and one of the few main courses on the menu. 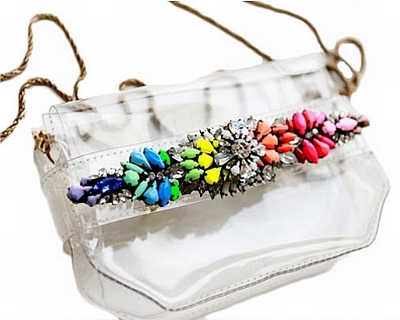 Founded in August 2013 by a close friend and former disciple in Sales, Sandy Trove or SandyTrove.com is a Singapore based, online shop retailing fashion accessories. 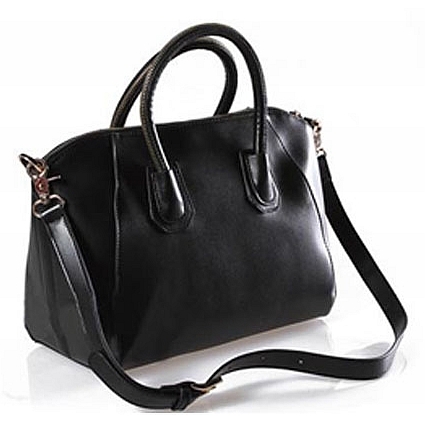 Invoking the calm, lesiurely feeling of relaxing by the sea, or finding buried treasure along the beach, Sandy Trove has a good range of ladies bags, necklaces, bracelets and charms. 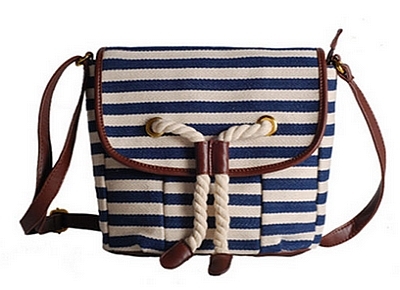 I like that Sandy Trove has a wide range of designs for bags. 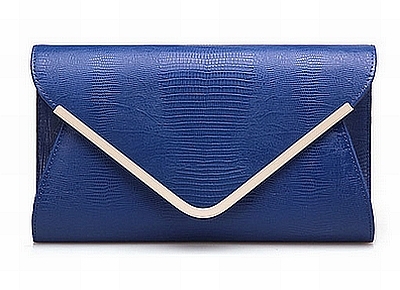 From handbags to clutches, slingbags to satchels, designs are regularly updated and refreshed. 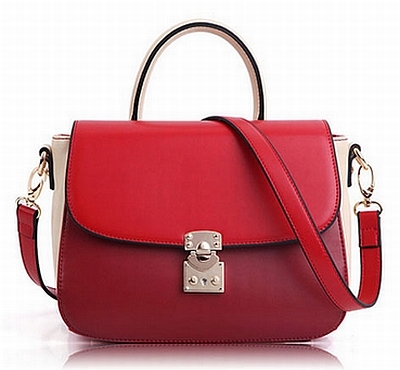 In particular, designs stand out for their sleek, modern look, with many suitable for office / business use. The range of designs for bracelets and charms veer towards the whimsical and playful, conveying a youthful feel. 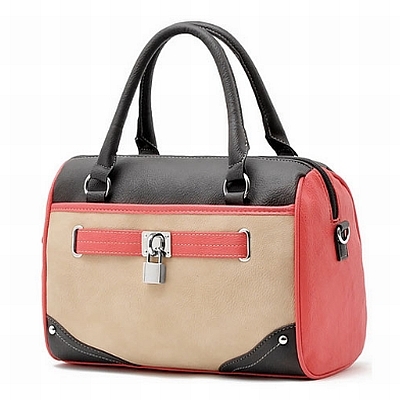 Designs include animal themes, love themes, seasonal themes, and more. Sandy Trove also takes requests from time to time, if you see an item you like elsewhere, you may request for Sandy Trove to help you source the item, and she will attempt to get it. 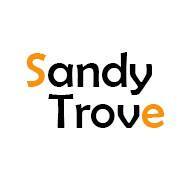 Sandy Trove provides International Shipping, and products typically take between 4 days to 3 weeks to arrive, depending on your country. 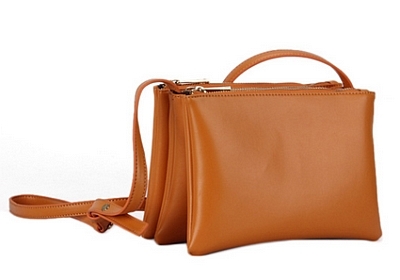 Sandy Trove also has a handy "look book" for tips and ideas on pairing your fashion accessories. 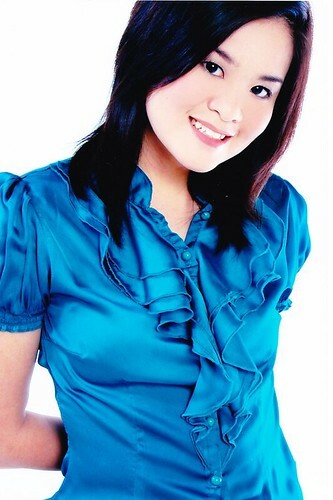 Check out Sandy Trove at http://sandytrove.com/, or visit the Facebook page at https://www.facebook.com/sandytrove.